The story of Dogtown and Z-Boys has essential messages about creativity and commitment for students and professionals alike so watch it carefully, and watch it more than once. The documentary film Dogtown and Z-Boys opens with the sturm und drang attack of Buddy Miles’s thunderous drum kit followed by Jimi Hendrix’s screeching, screaming lightning-like guitar licks that are then rhythmically rounded-out by Billy Cox’s thumping bass backbeat; Hendrix’s vocals then ascend and harmonize with his guitar’s notes. The Professor knows this song well; he’s listened to it since it was first released in 1971. It’s “Ezy Rider,” one of the stand-out tracks on Hendrix’s first posthumously released album The Cry of Love, and it sets the tone for the film Dogtown and Z-Boys. The song is the first clue that is not simply a “documentary film” to be watched; it is more accurately, in the vocabulary of critical thinking, a text to be questioned, called into crisis… reckoned with/decoded/analyzed/studied/closely observed. For The Professor, Dogtown and Z-Boys  is thus best understood as a coded, inherently subjective, intentionally pastiched construction—or in this case, reconstruction—of a particular cultural moment in American time and space. The choice of “Ezy Rider” as the scene-setting tune that kicks off the imagery also references the Z-Boys themselves: both Hendrix and the Z-Boys are lean and ripped, outsider and outsized personalities, rebellious by principle, as elemental as a burning fire or a crashing wave, and best when played loud and proud where it’s not necessarily allowed. In the film, the song is paired with a rapid-fire collaged sequence of archival still images and quick-cut home video clips. The onslaught of images shows kids skateboarding and adults talking about skateboarding, all set amidst various primal concrete infrastructures and artificial asphalt landscapes of the mid-1970s southern California beach scene. The juxtapositions achieve what the 20th-century playwright and theorist of theater Bertolt Brecht called the alienation effect; set forth in this manner, the familiar cityscape becomes something strange—something strange, but at the same time something wonderful and available. Much of the film’s footage is shot in grainy black-and-white; the vintage and the vibe is clearly early 1970s with 1975 probably being the key year. That first song “Ezy Rider” [lasting all of four minutes and nine seconds], sets both the mood and the momentum for the rest of the 91-minute film. Without identifying anyone in particular in the opening, it quickly becomes clear that the images flashing before us are younger and older versions of the same small group of people, the very characters who first gave form, function and meaning to the subculture of skateboarding as we know it today. 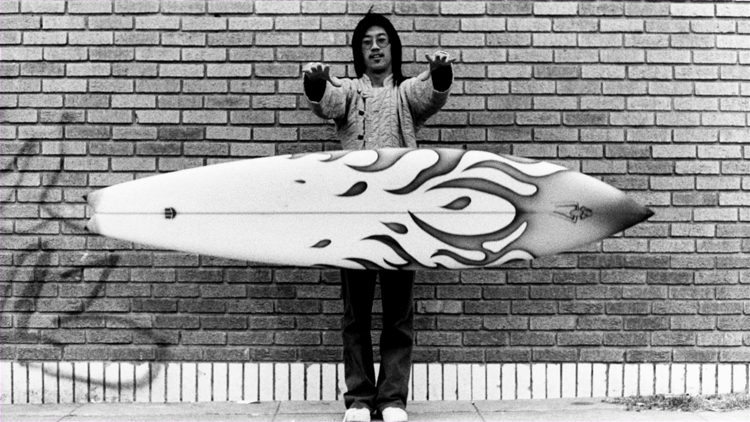 The Professor recently shared Dogtown and Z-Boys [note: despite the title, there was one Z-Girl: Peggy Oki] with his students at California College of the Arts [CCA]. This is the kind of film that The Professor recommends watching more than once, the kind of text that reveals its true self, its deepest lessons and hidden connections only over multiple close readings. The technique works this way: The Professor repeatedly stops, takes notes on what’s happening on-screen, and rewinds multiple times to watch the same footage over and over. The Professor searches for previously hidden details and in particular looks to uncover/discover patterns both overt and covert. This is the same method he used when he recently watched the music video “Scream,” and when he watches most time-based media. The Professor recommends this method of close observation and active contemplation of Dogtown and Z-Boys to anyone who still ponders the mysteries of the universe, to anyone who seeks the link between childhood curiosity and adult innovation, and to any and all who look to expand the possibilities that sustained exploration and creative engagement with one’s craft provides. Such an approach not only is worthy on its own merits, it is worth investigating from the perspective of the numerous Silicon Valley-like areas around the world precisely because similar plots play out there everyday in the pursuit of “a culture of innovation” and the fostering of “a learning organization.” People who may or may not know each other well, consent to clustering together in teams and forming small ventures to see if they can catch the proverbial entrepreneurial lightning in a bottle. Through the thick-and-thin of secret project names, custom project t-shirts, deadlines both real and imagined, and unprecedented corporate facilities with the amenities of a small city resort [in-office massage, chef-run restaurants, private bus and/or shuttle service for commuters, continuously stocked refrigerators, zen zones and fully-equipped game rooms] they seek, albeit through material means, the near-tribal kinship and unqualified commitment from each other that those 12 skateboarders were able to accomplish. With nothing going for them; the Z-Boys were the ultimate underdog team. On a daily, almost minute-by-minute basis, the people who fill Silicon Valley’s enterprises seek the modern-day alchemy whereby their group achieves more when they are put together as a whole than they could if they were separated. It is this sort of magical transformation—or perhaps more accurately that certain chemistry between individuals—they seek because they are looking to innovate, and to do so by an order of magnitude greater than the current standard. In the same way that many others [MBA professors, design historians, film crews and journalists of every imaginable background] have examined the entrepreneurial subculture of places like Silicon Valley in an effort to tease out their essential elements in order to replicate them elsewhere, we can [and should] study the Dogtown phenomenon with the same zeal and attention to detail; Dogtown offers significant lessons; it is “a learning opportunity.” In this context, Dogtown & Z-Boys is not simply a story of metamorphosis, it’s a lens onto a paradigm shift in the best sense of the term coined by Thomas Kuhn in The Structure of Scientific Revolution, a seminal text dating back to 1962. Although the word wasn’t in vogue at the time, they took the subculture of skateboarding viral. Let The Professor say that in a slightly different way to ensure that the message sinks in: they made something out of nothing. Something that was pleasurably infective. And they did it with the barest of resources. That is, they took what no one else wanted and they made it desirable, cool and even beautiful. Right there’s a lesson that thousands of frenzied, results-focused, race-to-IPO-or-be-bought-out, California-based entrepreneurs could benefit from, none more so than perhaps those in The Professor’s backyard of the San Francisco Bay area. But that’s precisely the point. You don’t need big-dollar venture-capital to make your mark, to radically innovate, or to pursue your bliss. What you do need is an infiltrative and pleasantly coercive idea, a shared commitment to the process of self- and group-improvement, a relentless desire to build upon your craft, to express and expand your creativity, a willingness to challenge both yourself and whoever it is you’re hanging out with, to have fun by willfully trying to outdo each other in an effort that is also understood to be communal at its core. Do what you enjoy and do it as if you don’t have anything else to do; live it. Use it as the fuel for propelling yourself through the rest of your career and your life. The Dogtown team provides a real-life lesson for how anyone, not merely artists and designers, can learn how to be more creative, can realize that that creativity can be further focused, and can even grasp how to prototype a model for how best to learn, and by extension, how to teach things that matter. To top it all off, the Z-Boys had a penetrating sense of desperation permeating their world. Dogtown itself was one of the last blighted coastal neighborhoods of Los Angeles, the kind of place where families chronically lacked money, where you had to have eyes in the back of your head if you were out in the neighborhood, where the kids were usually part of a single-parent household and without a lot of adult supervision. The Z-Boys were disenfranchised latch-key kids heading nowhere fast. Schools are not mentioned in Dogtown and Z-Boys in any classroom context; but schoolyards and playgrounds [along with city streets and swimming pools] were of great interest to the Z-Boys for the quality and quantity of their pavement—for the waveforms, tunnels, slopes and other three-dimensional landscaped shapes they afforded as a launchpad for a new way of skating. 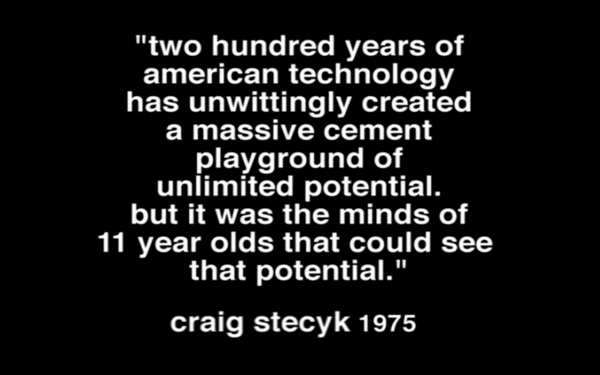 The outdoor asphalt and concrete was their natural learning environment: the place where they could experience up-close-and-personal the inevitability of the laws of physics as their implications played out in real-world runs: a lowered center of gravity enhanced turning while a decreased coefficient of friction increased speed. There they practiced the newest techniques and tested-out the latest ideas in the context of what had been done before, it was there that, once congregated, they could debate the relative merits of parking lots or culverts, and engage in their own version of critical thinking about their process, their progress and their plans. The Z-Boys were kinesthetic learners—the type of kids common at CCA and other art, craft and design schools—but it’s a population that’s also prevalent in elementary and high schools across the country. In class, they are the fidgeters and the doodlers, the restless disruptors, and the chronically curious about what’s happening outside of the classroom as opposed to in it. The Professor isn’t wired that way but after teaching for so long he has come to believe that such kinesthetic learners are chronically underestimated in terms of their intelligence, capability and numbers. But as the Z-Boys demonstrate, when their minds are engaged at the same time as their bodies, amazing things can happen. 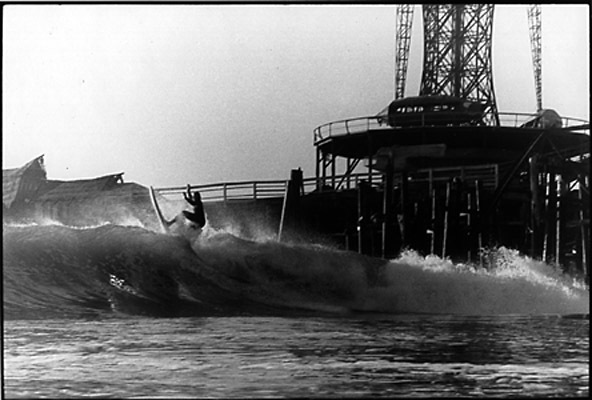 In the summer months, the Z-Boys would surf in the mornings amidst the piers of Venice while the waves were good and then skate and hang-out in in front of the Zephyr surf shop in the afternoons. They were relentless, not just putting in the hours practicing, but in pushing each other to do things on the board that they didn’t know they—or anyone else—could do. Improvisation was a core skill; blowing the minds of everyone else was the ultimate goal. 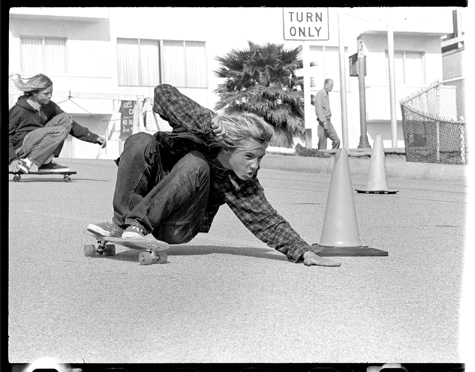 One of the youngest, Jay Adams, was notorious for getting half-way through a trick and then, right in the middle of it, deciding that he was already done with it and instead he’d launch into a whole new trick or ensemble of moves. 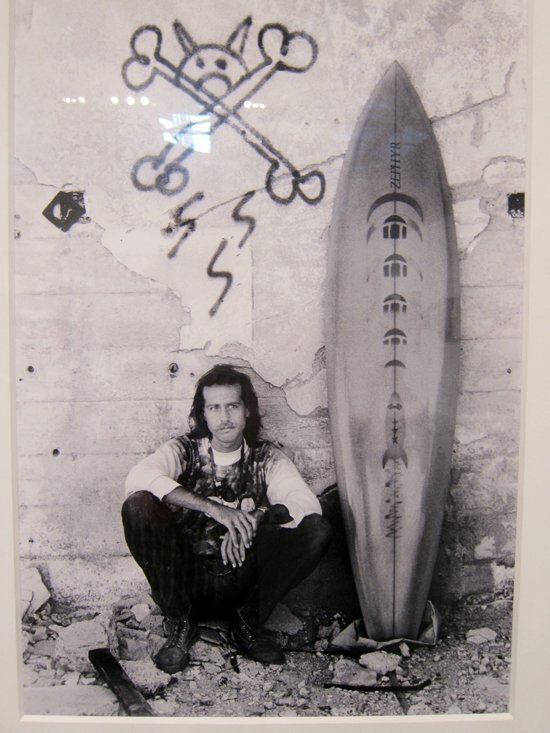 What Adams and the other Z-Boys were doing was honing their craft, to what we in the design world call iterations. But instead of iterating drawings and sketch models, they were creating on their feet, on the fly, in the true spirit of kinesthetic learners everywhere. Over time, the Z-Boys extended their surf moves to the street; doing high-torque turns; blending one movement smoothly into another; nimbly sliding, turning and riding in a low crouch on the board; and, dragging a hand on the asphalt as a surfer would through a wave [picked up from the technique of the legendary Hawaiian surfer Larry Bertlemann]. That dragging-hand style became known as a “bert,” or a bert slide, in his honor. 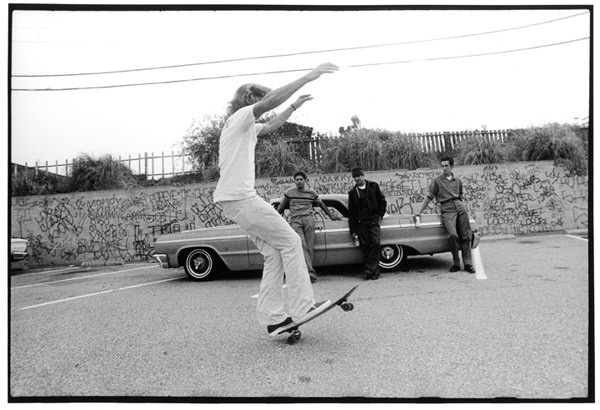 The film Dogtown & Z-Boys was put together by original Z-Boy and surfer-turned-skater-turned filmmaker Stacy Peralta [along with the shop owner, designer and photojournalist Craig Stecyk]. 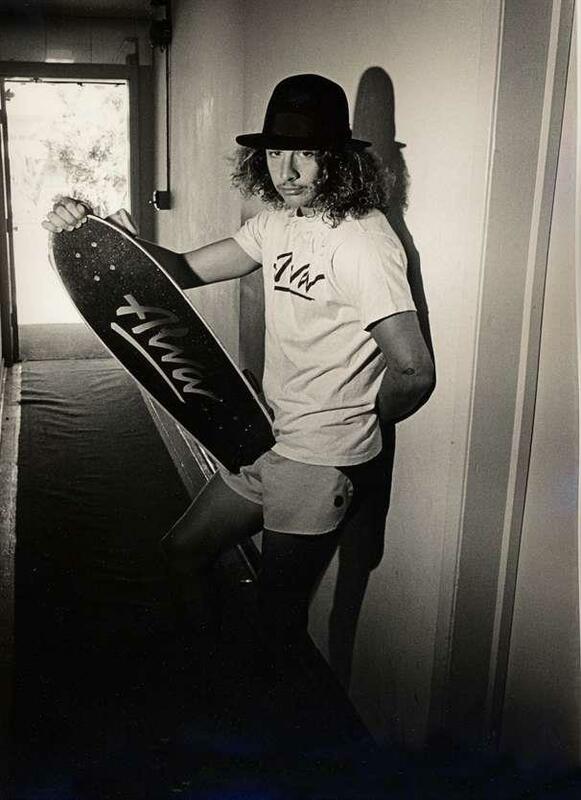 Perhaps only a figure like Peralta—a key player in the Dogtown scene as a skateboarder but also a successful entrepreneur with Powell-Peralta boards and who later put together the legendary group of skaters known as the Bones Brigade—could have had the chops to be director, producer and co-writer of Dogtown and Z-Boys. From the first frames of the film on, it’s clear that Dogtown and Z-Boys is a cut-and-pasted labor of love, a collaged paean to a golden era that likely wasn’t so golden to live through. Just as designers create seemingly endless sketches, models and prototypes in an effort to both solve a problem and to achieve elegance in doing so, the Z-Boys were relentless at trying new materials, new moves, new approaches, and exploring new places to skate so they could defy convention, raise the proverbial bar amongst their peers, and create a new style [for style was a word that connoted everything good to them]. Just like successful designers, the skaters aimed to fail sooner [and learn from those failures] so they could succeed sooner. Dogtown and Z-Boys is an epic, timeless story of challenge, personal struggle, discovery, failure, success, downfall, and, at least in some cases, redemption. You don’t have to care about the history of skateboarding to see this film as a source of inspiration. You just have to be committed to something. You have to believe, against all odds, that you can do something different, maybe even do it first. You have to have hope, especially when things seems hopeless. You have to be able to accept challenges on the fly and then quickly find alternatives—work-arounds that work. 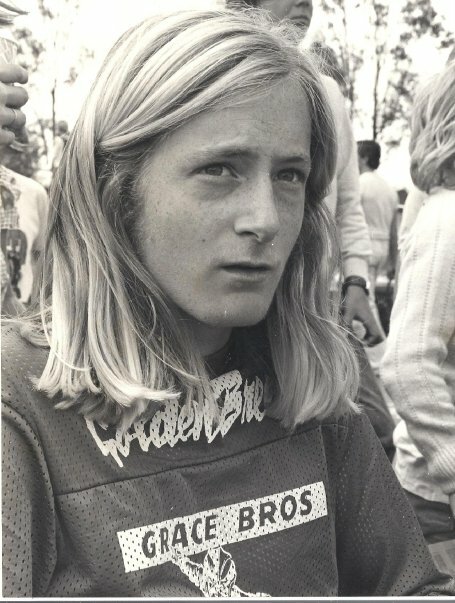 Dogtown and Z-Boys was narrated by Sean Penn, a nice twist for it was Penn who, as a kindred L.A. spirit, starred as Jeff Spicoli, the stoned surfer in the will-he-ever-come-of-age movie classic Fast Times at Ridgemont High. 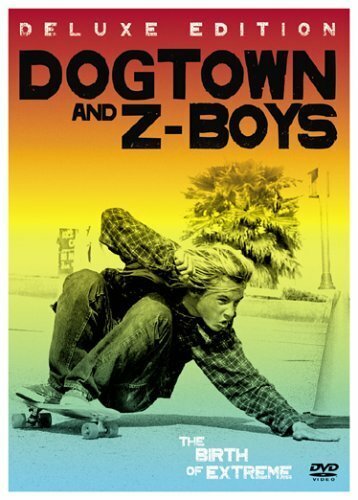 In its own way, Dogtown and Z-Boys is both an inspiring text in terms of what the Z-Boys were able to make happen given such limited means, and it is a cautionary tale about what happens after many of them thought they had it made. Of the original 12 Z-Boys, four are already dead as the result of poor life choices and either too little, or too much, success: Bob Biniak , Chris Cahill  and Shogo Kubo and Jay Adams ; all were in their 50s. This brings The Professor’s review to a close, albeit one with a more personal message to the denizens of Silicon Valley and the San Francisco Bay area. After all, this is the place that The Professor moved to almost 25 years ago because he saw opportunity, excitement and the future here. He wasn’t wrong. But he also found what the Z-Boys discovered years earlier: what he thought was “success” wasn’t really what he thought it was once he got it. We should all be careful what we wish for. 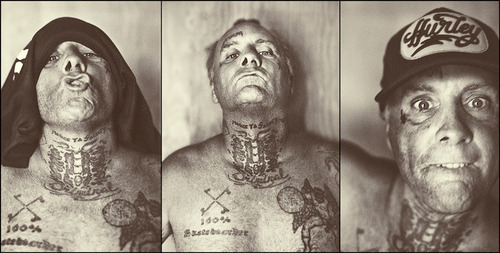 The Professor identifies with the Z-Boys before him, especially the late Jay Adams. Not because The Professor is a surfer-skateboarder but because he has been battered, aged prematurely and [more times than he can count] been beaten-down and humbled through a series of medical challenges beyond his control. But so far, knock on the proverbial wood laminate, The Professor has been able to do what Shogu, Bob, Nathan, Stacy, Jim, Alan, Chris, Tony, Wentzle, Peggy, Jay, and Paul did over and over in their day: Get up off the ground, reorient himself in the cosmos, and try yet again. As the Z-Boys showed—the ultimate reason to get back up is based in hope and rooted in resilience. In another lifetime, a well-suited exec at the behemoth Young & Rubicam advertising agency was interviewing the fledgling Professor for a coveted position and he asked if he loved to win more than he hated to loose. The Professor said both, immediately wondering if there was, if not a correct answer, at least one that the exec was hunting for. The Professor will never know that answer, but that question has come up dozens, if not hundreds of times for him during the intervening years. After reconnoitering with his health struggles dating back to 1997, The Professor now knows, without a shadow of a doubt, that winning is no longer the exciting, motivating possibility it once was. The action is in trying to elevate his hatred of losing to that of an artform, to expand his curiosity and his creativity as a means of life-extension—and that’s why they call me The Professor. n.b., While “Ezy Rider” is the lead track, it is but one of many inspired musical choices in the film including: Aerosmith “Toys in the Attic,” Alice Cooper “Generation Landslide,” The Allman Brothers “One Way Out,” Black Sabbath “Paranoid,” Blue Oyster Cult “Godzilla,” Buzzcocks “Fast Cars,” David Bowie “Rebel, Rebel,” Devo “Gut Feeling,” James Gang “Funk 49,” Jan and Dean “Sidewalk Surfing,” The Jimi Hendrix Experience “Foxey Lady,” “Freedom,” and “Bold as Love,” Neil Young “Old Man,” Pink Floyd “Us and Them,” The Stooges “Gimme Danger” and “I Wanna Be Your Dog,” T. Rex “Children of the Revolution,” The Pretenders “Bad Boys,” and numerous others of less interest to The Professor.